Inspired by a quantum mechanical formalism to model concepts and their disjunctions and conjunctions, we put forward in this paper a specific hypothesis. Namely that within human thought two superposed layers can be distinguished: (i) a layer given form by an underlying classical deterministic process, incorporating essentially logical thought and its indeterministic version modeled by classical probability theory; (ii) a layer given form under influence of the totality of the surrounding conceptual landscape, where the different concepts figure as individual entities rather than (logical) combinations of others, with measurable quantities such as ‘typicality’, ‘membership’, ‘representativeness’, ‘similarity’, ‘applicability’, ‘preference’ or ‘utility’ carrying the influences. We call the process in this second layer ‘quantum conceptual thought’, which is indeterministic in essence, and contains holistic aspects, but is equally well, although very differently, organized than logical thought. 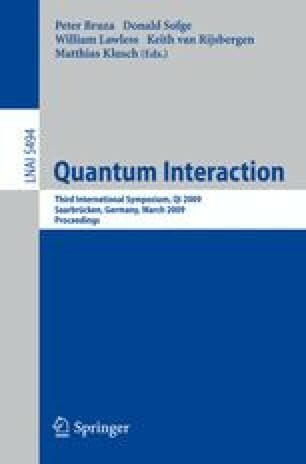 A substantial part of the ‘quantum conceptual thought process’ can be modeled by quantum mechanical probabilistic and mathematical structures. We consider examples of three specific domains of research where the effects of the presence of quantum conceptual thought and its deviations from classical logical thought have been noticed and studied, i.e. economics, decision theory, and concept theories and which provide experimental evidence for our hypothesis.